It should be no surprise to the intrepid readers of this blog that a time machine with the controls set to the late 40's and early 50's would be the number one item on my science fiction wish list of impossible gadgets. 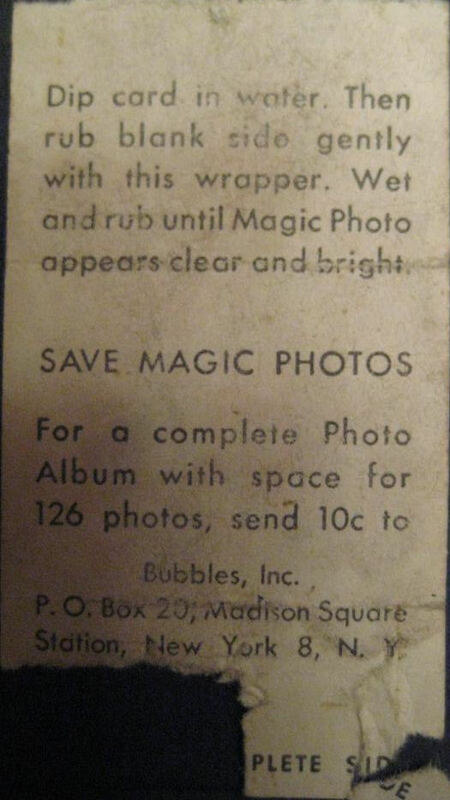 You see, the plan would be to find and purchase a large quantity 1940's U.S. Currency, go back in time and then buy up all sorts of goodies that would be mailed to my childhood home (purchased in 1956) with a note to my dad saying "do not open until Christmas 2010". Pops is a good guy and fellow collector (of toys and trains mostly, not cards) and he would definitely squirrel away such care packages as instructed. That ad is from the April 29, 1950 issue of The Billboard, which as we all know used to cover all sorts of amusements and vending concerns in unbelievable detail until it went mostly music only in 1961. 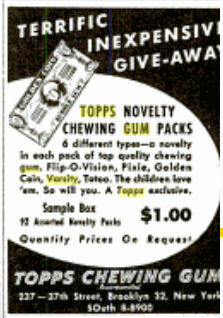 While Topps indicates 6 different types of Novelty packs were available, they only list five in the ad: Flip-o-Vision, Pixie, Golden Coin, Varsity and Tatoo. The sixth could have been either Hocus Focus (the Magic Photo pack, not the later issue) or Stop 'N Go license plates. 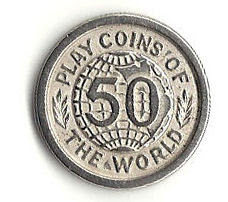 Another nickel pack like the Flip-o-Vision or Golden Coin is also a possibility. It was probably left open-ended so whatever return from the distributors was occurring at the time could be included. The ad reappeared in the May 27 issue so Topps clearly had some overstock to move. 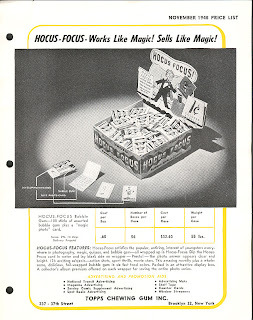 While that fact and the ad itself are noteworthy, what's even more interesting to me is that every novelty issue described in the ad is known to definitively pre-date 1950 with one exception: Varsity, which contained the small Felt Back Football cards. The Felt Backs have been the subject of past scrutiny via articles in hobby publications over the years, there being two distinct schools of thought. 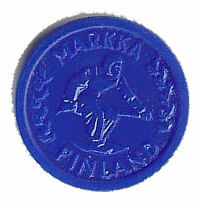 The first is that they were issued in 1949 and then reissued the following year. The second is that they are a 1950 only issue. 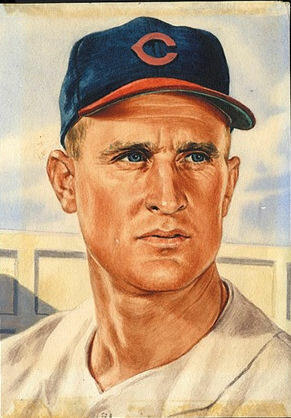 Even Topps is at odds with itself on this; Sy Berger was in the 1949 camp while the corporate office in the early 1990's was in the 1950 only camp. I think this ad eliminates the possibility of option #2 as it would not have allowed enough time for returns of the set to flow back to Topps. I also doubt they would have sold football cards in the early months of 1950 as they really would only be attractive in the fall. The wrapper carries a 1949 copyright by the way, which is meaningless as Topps sometimes copyrighted things a year or two before issuing a set. Tatoo is another issue that may be dated incorrectly as some veterans think it was a 1948 issue, although it seems pretty clear from reading Chris Benjamin's guides that is came out in 1949. 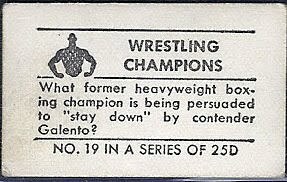 This ad does not give any further insight into that but it gives a pretty good look at what didn't sell through for Topps in '49. Flip-o-Vision, which was a gimmick set of flip movies, had been beset with various licensing issues and may have been intentionally pulled from the market to avoid litigation. 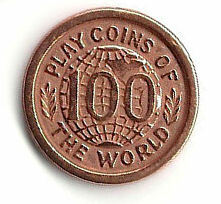 The Golden Coin set was probably just a poor seller as the coins are not around in any quantity today. 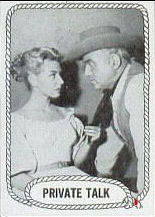 Tatoo may have been overproduced as it seems to have sold well enough to be reissued and expanded in 1953 while Pixie, which held X-Ray Round-Up cards, was probably severely overproduced even after selling quite well. Likely a second run was printed after the first one sold like gangbusters. Multiple vending bricks of X-Ray Round-Up have been found after the fact so there was a bunch of unsold product out there for sure. That leaves Varsity and with Bowman and Leaf having the NFL locked up in 1948/49 in a supposed deal that gave the former the 1948 season and the latter the '49, Topps was left with the less appealing college football market. Given the scarcity today of the felt backs, it would seem even this attempt at an aboriginal fun pack met with limited success. I'd guess the remainder of the products intended to populate the unsold 100 count sample boxes were ultimately destroyed, possibly dumped in 1960 along with the 1952 baseball high numbers by Sy Berger himself. 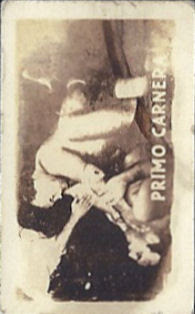 The card is in an SGC slab, so she can kiss away without fear of damaging this rare specimen! As noted previously there are 15 Kiss Bobby cards, I suspect one of them is the Kiss Print card shown earlier and which would likley have been overprinted. Oh, it has been a Christmas extravaganza here at the main Topps Archives Research Center (TARC TM). All sorts of wonders were revealed (way too) early this morning and now all the Little Archives are all sound asleep or playing Xbox Live (possibly both). Mrs. Archives whipped up a traditional batch of her homemade Bailey's, a wondrous concoction full of froth and fire that knocked her out and off to bed. Your fearless blogger, facing an evening of Quincy reruns on the Roku or a free evening of teh Interweb, has opted for the wonders of the digital cloud. What does it all mean? I have no idea. So I'll leave you with a simple sign tonight, as I am done in. This baby was featured in a semi-recent Hunt auction and caught my eye, albeit well after it was gaveled down at a nice four-figure price tag. I thought it was neat and old (from the 40's) so it's a perfect fit here. It measures a little under 8 inches high and almost four feet in length. It hung at the old Topps Bush Terminal HQ for years and you can see how the wood weathered but the paint remained, likely as it was lead based! 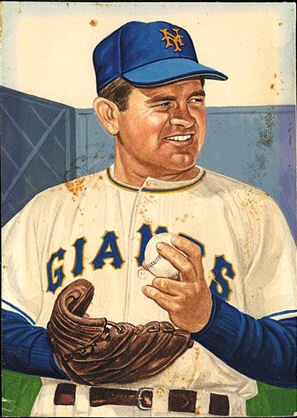 I've been having a bit of a think about the unissued 1953 Topps cards I covered here a little while back. As we all know, there are six holes in the 1953 Topps baseball set, with the operating theory being the players were pulled from distribution due to contract disputes with Bowman. Well, sometimes the obvious solution is right before you and you miss it; I suspect I may have done that with the paintings used to create the cards by not considering the glue residue stuck to their fronts. The three paintings from the Autumn 1981 Baseball Cards magazine collage I showed previously are obviously candidates but I think only two of them have glue remnants in a pattern on their surfaces: Castiglione and Cox. The Pafko looks like it has a stain in the middle of the card but I pulled the magazine article again and it looks more like a water stain to me, rather than glue. The Cox pattern is harder to see in the scan but it's definitely there and runs horizontally across his thighs and, uh, junk. Castiglione displays an L pattern which is pretty easy to see. 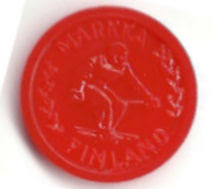 Note how the glue residue is not running along the edges of each but is more in the middle. 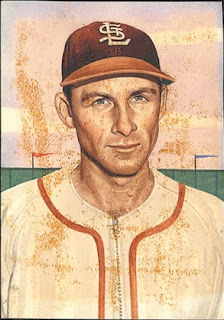 I suspect this was the result of a mask that Topps used in photographing or copying of the paintings so they could be pasted up and printed. It's almost the opposite of what you would expect, I wonder if the process used to remove the mask caused all that muck swirling around his mug? Top and bottom look very clear to me. We also had the unissued Wood card (click back to see) but it's clean as a whistle so I suspect it was never introduced into the production cycle. Some of the HOF'ers from the Guernsey's auction in 1989 (again click back for a look) looked very clean and were obviously made into issued cards but I understand those were stored separately from the Berger stash and it looks like they were recognized as "keepers" by the Topps brass even way back in the 50's. And I have to wonder if Pafko was pulled and replaced by yet another card that was pulled. 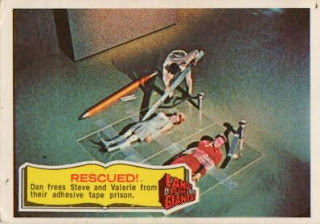 Still, the glue that holds this thread together may be the same stuff used by Topps fifty eight years ago! So are these the true missing six? I think it is very, very possible. The early days of Topps continue to bring surprises. 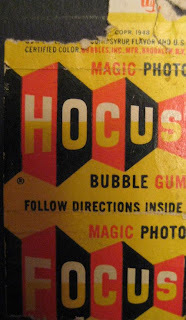 Their first really wide-release, multiple series cards were issued in late 1948 into 1949 and included the 252 card strong Magic Photos, a set oft-blogged about in these parts. 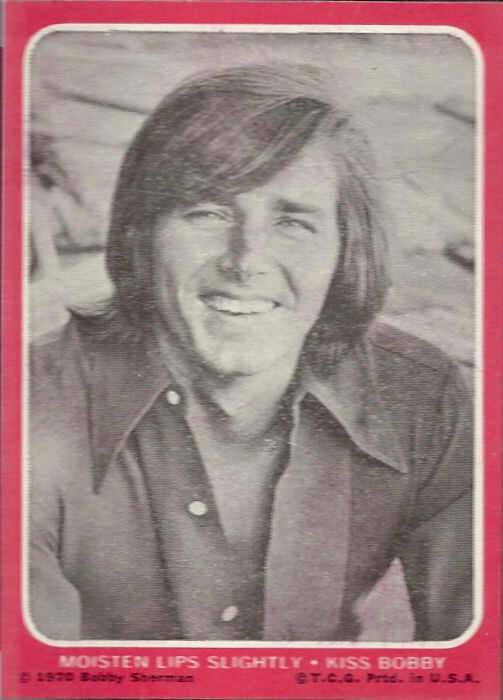 These "wet and develop" cards were issued in two 126 card series and deemed worthy of two separate albums, so the set was obviously a stellar seller for Topps. One way we know this is that we can determine at least two, possibly even three print runs for the first series, which if you are up on your sub-setting skills, you would know has eight distinct sub-series, alphabetically identified from A-H.
As you can plainly see, the instruction to SEE DIRECTIONS INSIDE WRAP is gone and the card and series numbering has been moved to the bottom of the card from the left side. All of the above scans are courtesy of Rhett Yeakley by the way. Rhett sent along other scans as well which show the more sepia leaning photos are distributed among both backs, so no help there in terms of possible reasons for alternate printings. It does look like however, that the font on the back of the cards without instruction is slightly finer and clearer than the one used on the SEE DIRECTIONS backs. Both types are presented and may have resided in the same scrap book. I am still searching for alternate backs in the second series, which runs from J-T subset-wise (no "I" series was printed). Also, there do not seem to be nearly as many second series cards and grouping are not sighted nearly as often. The second series album, which features the same cover as the one from series one, is also harder to find than the first. But wait, there's more! I am not aware of any other gray borders in the set, so it's a headscratcher; possibly this was the result of a liberal application of developer but there is allegedly a lone front variation with the boxers so this could very well be it. 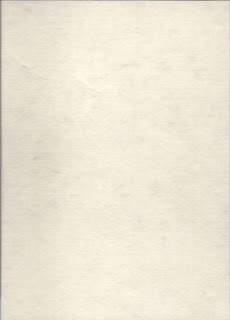 The back of the white bordered card has the standard FOR DIRECTIONS back but I do not know the back of the gray border, although it is described by the seller as part of the Magic Photos set, so it must have one of the two know backs as he was heavily trumpeting the gray bordered front and would, IMHO, certainly have mentioned a strange back. But wait, there;s STILL more! You can see score lines on this panel, which is second series in flavor and would have come in the uber-scarce 5 card pack (or wrapper), click and scroll to see one. 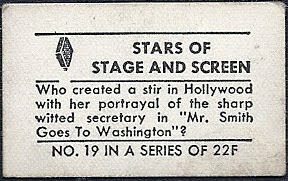 The perforations would have been from panelized cards,although I have to confess I thought the panels were scored and not perforated. 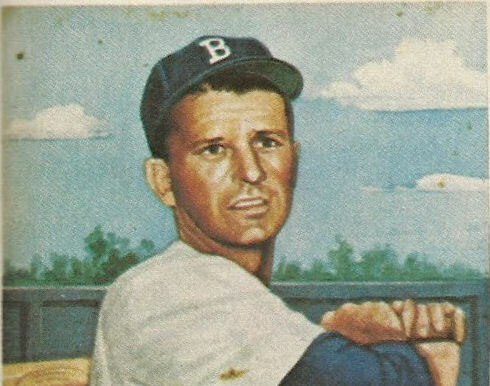 First series cards often seem to have either chipped front borders or super straight edges on their long sides. I have hear rumors of cards with rounded (at the factory) edges; if they exist I suspect they are from the first series. 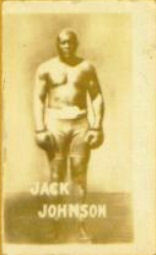 Series 1 Gray bordered Jack Johnson? Cards from both 126 card series are listed in the ad. Yikes! The cards look ready in November '48 and really the photo must have been shot earlier than that. 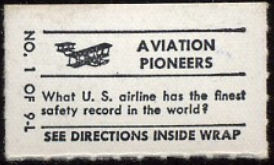 Perhaps the 1948 and 1949 versions differ, explaining the variations above. Still, it would seem the backs without instructions were either pulled from vending boxes or sold where instructions were posted elsewhere, like on a gumball machine. 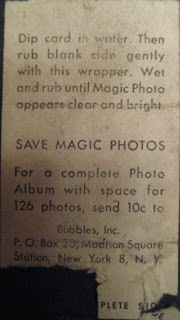 It's even possible the "No Instruction" backs were sold with the pictures already developed. The again, perhaps not! 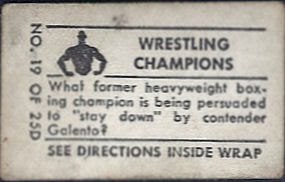 I am hoping there is more information out there on these cards; they get more mysterious as each year passes. Would I be shocked to see rule breakers? No sir, I would not! Ah, the heady days of the Jet Set: Sinatra swingin' on the radio, cocktails clinking and exotic destinations beckoning! Even Topps got into the act, with their 1956 Jets set, a 240 card ode to flying machines. 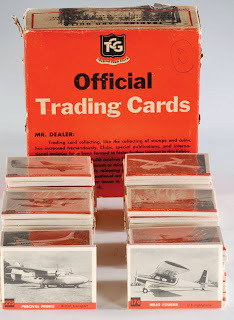 The small black and white cards, as we know, were sold with Trading Card Guild overtones and an album was made available for easy storage and display. 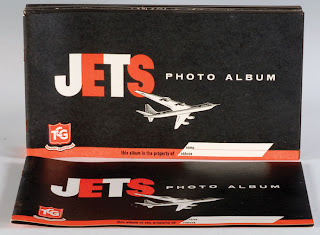 Normally that red and black box would have held 36 packs of Giant Size cards but due to the smaller dimensions of the Jets cards, 62 cellos were contained within. So the artwork for the cello boxes was actually on the box for the albums! 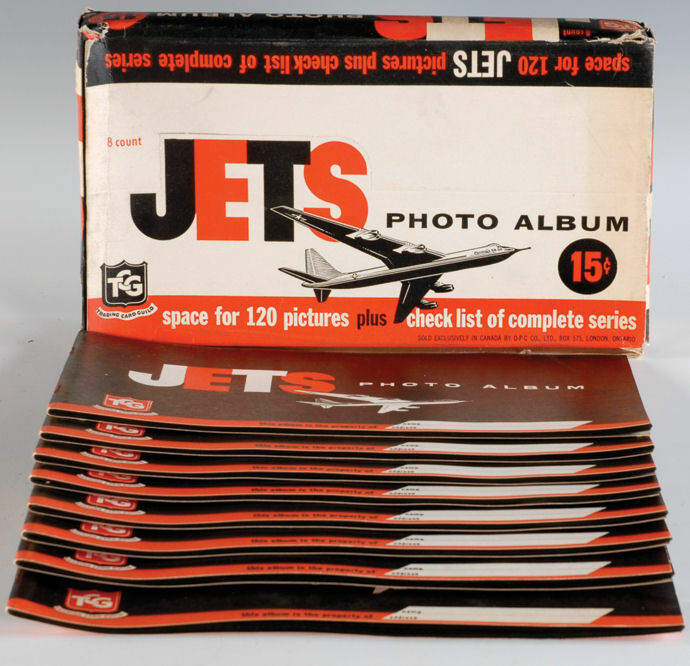 Each album held half of a full set (120 cards) so 30 cents were needed for the entire run of 240 to have a nice home. Neat, huh?! 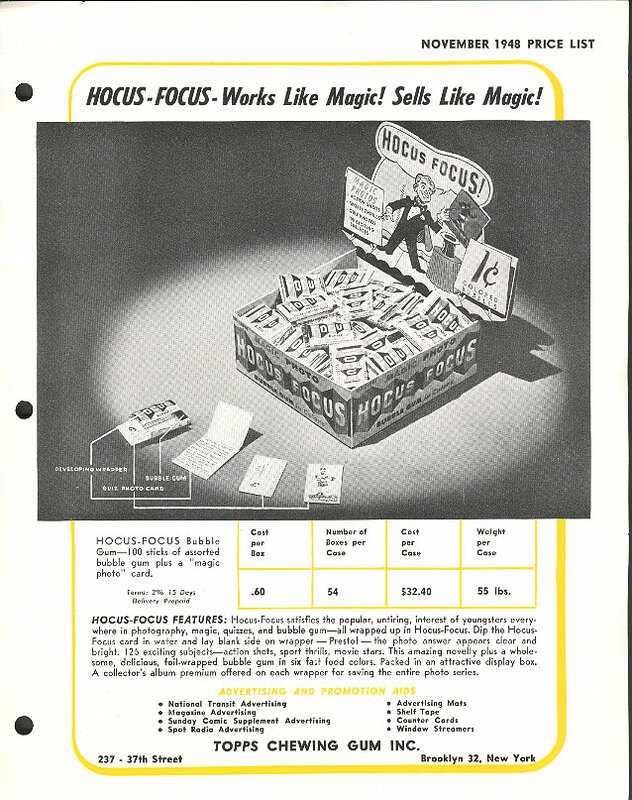 The cards were also sold in two types of penny packs, one repeating the look of the box art , which to be fair to the Guild, was prominent on the penny and nickel packs and boxes. 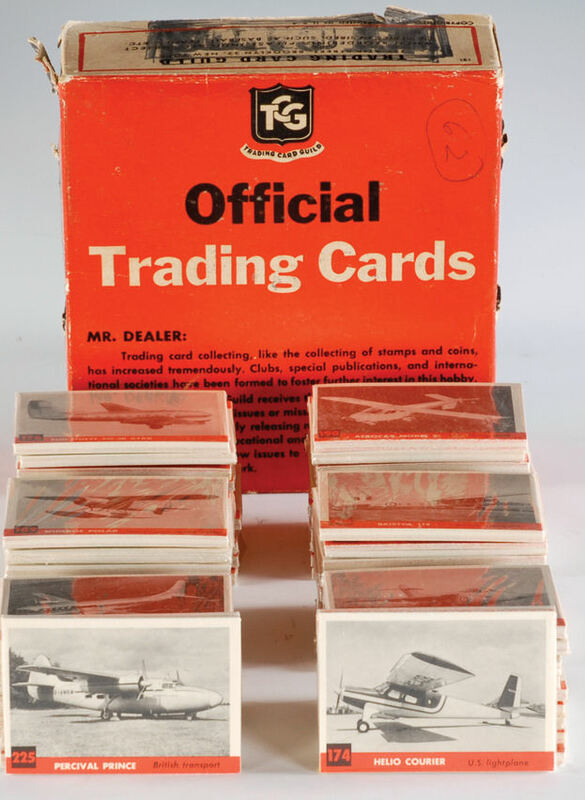 But another penny pack was issued called Fighting Planes, giving a militaristic look to things. I can't find a good scan of that pack at the moment but stay tuned as I am feverishly gathering all sorts of scans from the 40's and 50's of anything to do with the smaller Topps cards. I'll add it here when I locate it. I have mentioned these before-Play Money Pops were a "big box" with a dozen lollipops and seven Play Coins enclosed. 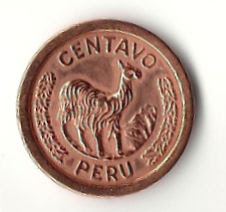 Nineteen cents is a possibility for this item, as is a quarter. 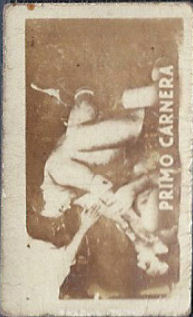 The Topps Candy Division marketed the pops, whereas Topps Chewing Gum marketed the penny gum packs. According to The Sport Americana Price Guide to the Non-Sports Cards 1930-1960 (by Christopher Benjamin, 1993 Edgewater Book Company), from which I took the above scan, the box back states there are 72 coins in denominations of 25, 50 and 100. 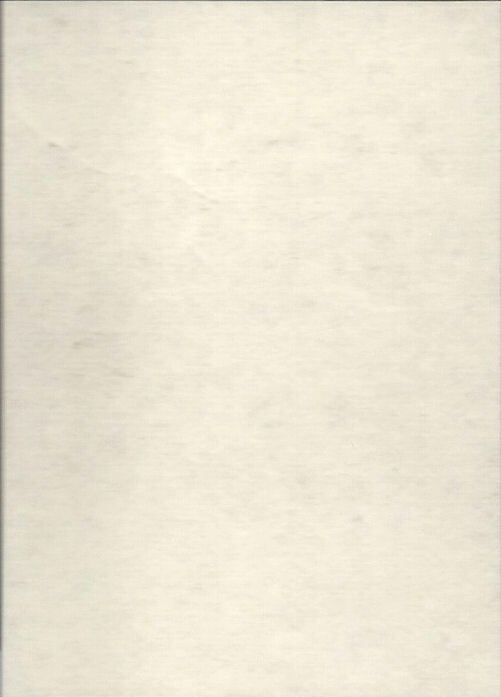 Interestingly, there is an extant ad for the pops in the Benjamin book but I can't get a good scan so it's not shown here. 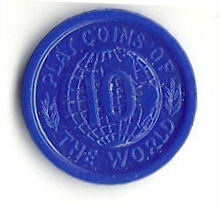 1) Penny Pack-120 in number 5,10,25,50 100 in green, blue, red, gold and silver. 3) Ten Cent bag of coins, possibly as per above coins plus adding a yello 1 denomination coin for each country so 144 set total with 24 yellows added to the 120 previously issued coins. Addign yello may have been a ploy by Topps to resell old, overstocked coins and new product together. 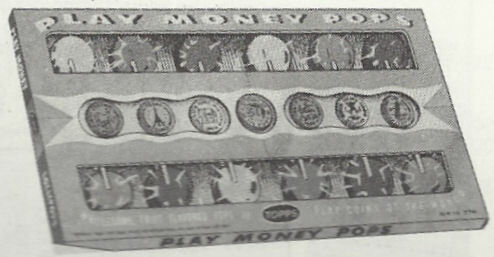 4) Play Money Pops-72 in number, 25, 50 and 100 denominations, all in metal. 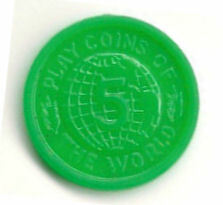 Benjamin mentions the coins that came with Play Money Pops had plastic cores with metal coatings of brass, copper or nickel. If the copper 50 and 100 pieces displayed in my last post are not from the lollipop issue, then there may be a fifth permutation out there. Crazy! A tantalizing mystery partially solved yet spawning more questions today cadets! 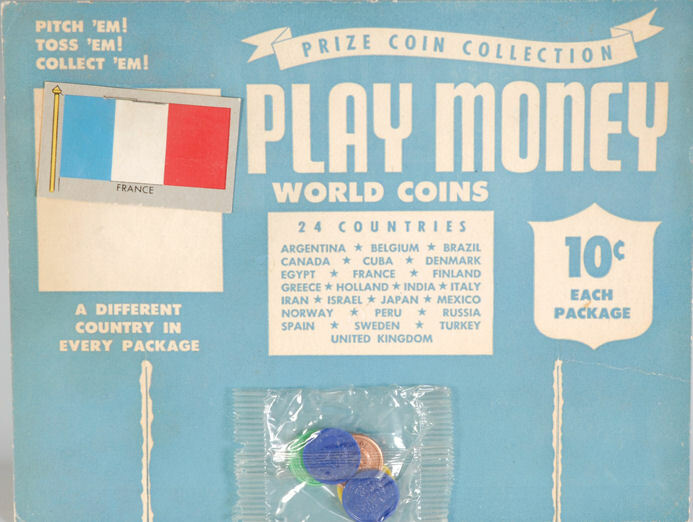 The 1949 Play Coins of the World issue is a big touchstone here at the Archives, as it is one of the earliest sets issued by Topps. Seemingly issued as 1948 turned into 1949, this little set identified as PX4 in the American Card Catalog may in fact be two sets in one. 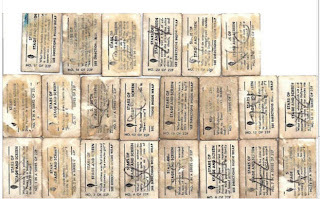 I had previously questioned the size of the set, described as 120 in number by Topps in period advertising but truncated by some other sources. Thanks to a recent Ebay victory, I think I can set the count at 120 but only for what is the plastic version of the set (yup, there is more than one variety-keep on reading!). 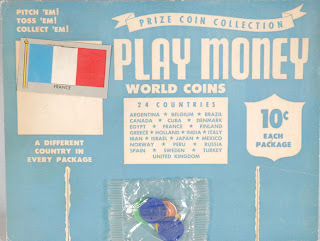 A large cache of coins, of which my win reflects but a small part, has been auctioned in recent months at the world's biggest garage sale and there appear to be five colors, each pegged to a specific denomination, for each of the 24 countries represented in the set. and the 100 in what could either be gold or copper; gold is more romantic but copper is more practical, no? Silver and gold are merely plastic made to look like metal and I must say they look pretty spiffy and even shine a bit. Copper and gold likely have cross-polluted in some listings so that may be one run of 24 we don't have to count; which one--you tell me! 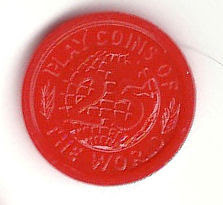 The Play Money of American Children site indicates yellow coins with a 1 denomination exist but I have never seen any of that color or amount in the current auctions or in various online searches so that could be either an error or represent a scarcer type or even one of the possible side-sets (subset seems incorrect here) I'll touch upon momentarily. There is a lot of play money out there, by the way. That scan is from a mixed Ebay lot of mostly coin like products. The first problem is that the 50 denomination is the same color as the 100. Mistakes can happen and the end of production runs can result in the breakage of patterns within sets but the thing is, the above two coins are corroded in the telltale green of copper after oxidation ends and thickening begins. Therefore, the above examples are made of metal but I have no idea where they are from. 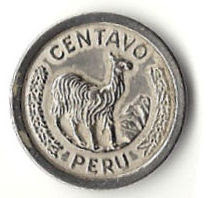 Certainly it is possible other denominations exists in metal as well altho' it might just be the two highest. 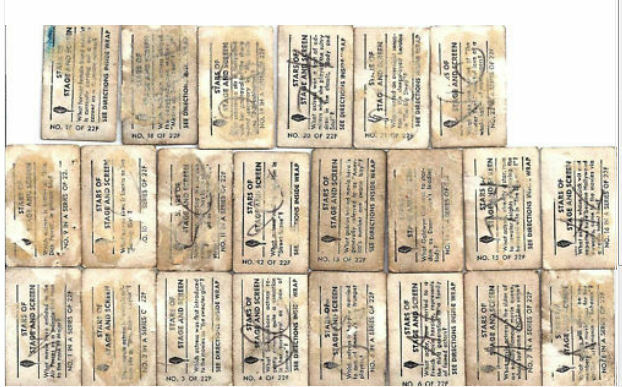 I do not think Topps manufactured these, as it would be very inconsistent for them to do so as third parties generally did their printing and other production related to the gum pack inserts. 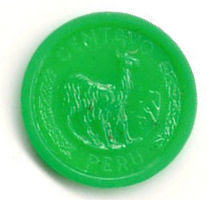 Did Topps make plastic coins from molds already created to produce metal play coins or did they only have a license for a specific period of time for these? Ah, sweet mystery.....if you have any ideas, drop me a line. 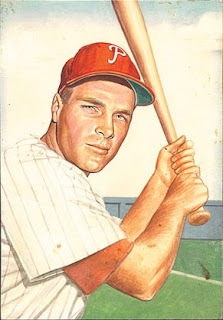 Rounding out the decade kids, with the rest (I think) of the B&W TV show cards produced by Topps in the 60's. 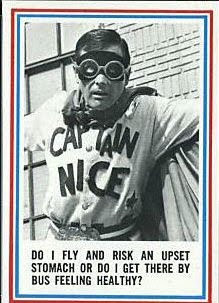 1967 brought a very strange show to TV: Captain Nice, starring William Daniels as a mild mannered superhero with a costume sewn by his mom. 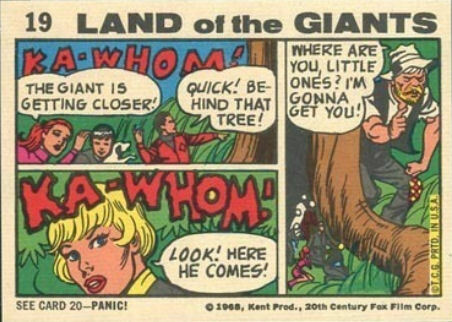 It looks to have been a mid season replacement and aired from January to May in '67, lasting 15 episodes. 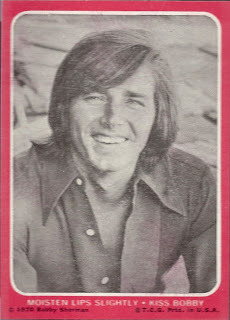 For some bizarre reason, Topps produced a 30 card set of this color show in glorious black and white! 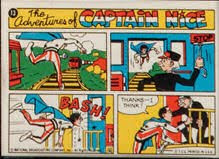 LOTG is not as tough as Captain Nice but it's scarce. A&BC also did a Giants set in the UK a year later that is far easier to find. 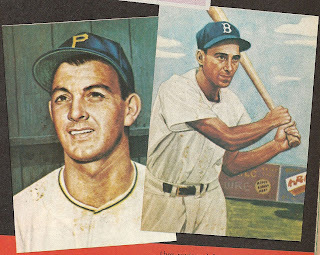 Many Topps test and limited release issues were repurposed for the UK and to a lesser extent Australia, Holland and Israel starting around 1967. That will be the subject of a lengthy series here someday. Yes, Bonanza-the set I consider the rarest ever produced by Topps, although I admit Flipper and a couple of others give it a run for the money. That one little splash of color indicates to me production around the time of Captain Nice, maybe 1967, or within a year either way. Allegedly produced as an almost in house gag by Topps, Bonanza cards never were sold at retail. 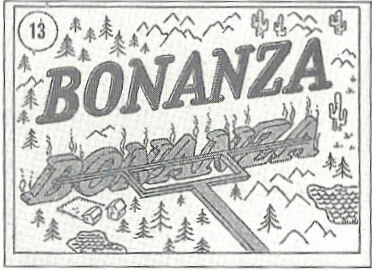 Bonanza was shown in color from its first broadcast in 1959 through its last in 1973 (431 episodes buckaroos! ), which was unheard of at the time, so of course we get more B&W, although I can't swear to the print on the back being B&W, I have heard it is brown. There are rumors of other test or proof sets out there for F Troop, Green Acres and I Dream of Jeannie. All but Green Acres had at least one black and white season. Not that it would matter if they were all shown in color to fit in with our grouping but if a card surfaces from any of these three shows, I would not be surprised if it is in black and white.